James Earl Armstrong, 85, joined his Heavenly Father on Thursday, August 16, 2018, after a lengthy illness. Earl was born on October 2, 1932, in Sweetwater, Texas. Following graduation from high school, he served in the US Army during the Korean War. He was stationed in Korea and Japan from 1952 – 1956, where he served with the 1st Calvary Division, 8th Engineering Combat Battalion. After his discharge he returned to Sweetwater, TX, and married his high school sweetheart, Wanda Christine Davis on August 10, 1957. Earl was a carpenter by trade and worked hard to support his family. He retired from the OU University Hospital maintenance division in 1994. After retirement he enjoyed traveling with his wife on Amtrak and camping. Earl was preceded in death by his grandparents, WG and Katie Armstrong, who raised him, an infant son James Michael (Mikey), and his brother, Don. 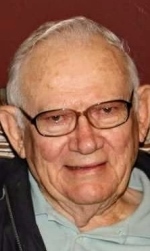 He is survived by his wife, Christine, of 61 years, three daughters, Sheila Oakley, Connie Armstrong, and Tamara Dawson, six grandchildren, Shannon, Melissa, Brandon, David, Zachary, and Madeline, and seven great-grandchildren, Chaylee, Emmalee, Shaylie, Michael, Christian Parker, Makenzie, and Allyson. In lieu of flowers donations may be made to the Wounded Warrior Project or the Alzheimer’s Association. The family will hold a private service to celebrate his life, and he will be laid to rest at an inurnment service with military honors at Arlington National Cemetery in Washington, DC.